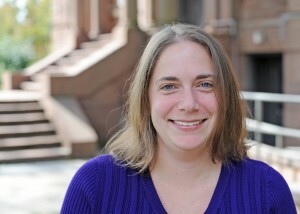 Associate Professor Barbara Juhasz is interested in how words are processed during reading. Wesleyan Associate Professor of Psychology Barbara Juhasz and alumna Jennifer Brewer ’13 recently coauthored an article titled “An Investigation into the Processing of Lexicalized English Blend Words: Evidence from Lexical Decisions and Eye Movements During Reading” in the Journal of Psycholinguistic Research. Their work examines the process of blending, through which a new word or concept develops from the synthesis of two source words. Some examples of common blended words include “smog,” “brunch” and “infomercial.” Though previous research on blending has inspected the structure of blends, Juhasz and Brewer examined how common-blended words are recognized compared to other kinds of words. Pairing blend words with non-blend control words of similar familiarity, length and frequency, the study asked participants to complete tasks involving lexical decisions and sentence reading. The results found that participants processed blend words differently from non-blend words according to task demands. In the lexical decision task participants recognized blend words more slowly but received shorter fixation durations when read within sentences.